One of the most interesting books I have read recently is another book on memory Why Life Speeds Up as You Get Older: How Memory Shapes Our Past by Douwe Draaisma. I've mentioned this writer and his book on the metaphors of memory before. Somehow, when I was playing with my bricks, I fell and cut my lip badly and had to be taken to hospital to have stitches. The strange thing is I can't remember the moment of injury but I do have a memory of the scene immediately afterwards. It comes as a single snapshot of a street. It is as if everything is silent even though I know that it couldn't have been. I see a pale panorama of distant houses and a white sky and I have a very vague recollection of people. I know they are there but I'm not really noticing them. My clearest memory is that of the wing of a light blue and white car - which must have been a neighbour's because I am not sure that my parents had one - and I have an idea that I am being held in someone's arms and wrapped in a blanket. The strangest thing about this memory is that everything seems washed out and almost colourless...and the silence. Sometimes it seems close to a dream. According to Draaisma's essay, people sometimes see themselves in their memories. They stand apart as if they are looking at the child that was them. But I am there in this scene looking at the car, and it is this that is interesting me. I expect I am frightened (probably by my mother's reaction) and my mouth must be hurting but I don't remember either of these things. I am fascinated by the prospect of a journey in my neighbour's car and I have the vaguest memory of feeling cold. But how much of this is true? Sometimes I wonder if this is really a memory or something partly invented because I have often returned to it in my mind. 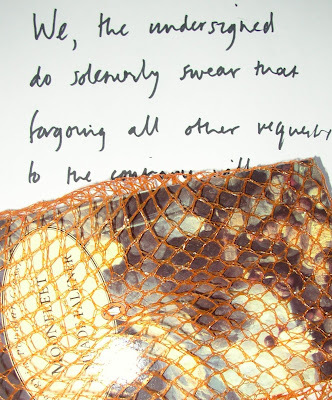 It is 'my earliest memory' and consequently I cherish it and revisit it - perhaps too much. Yesterday I felt as if I had somehow collided with a wall; giving a talk always has that effect, I find. The day after I am so tired I can't seem to move. I can't understand why this should be so. Some people seem to take it all in their stride. They go from talk to talk, smiling serenely, relaxed-looking and happy. Not me. I enjoy giving my talks but they take a disproportional slice from my life. Perhaps it is just a case of getting used to it, but I have given so many of them now and I still feel the same. I am beginning to feel there is no hope. Today I am preparing for another. I've been invited to a workshop at the LSE and have to give a short presentation there. The other participants look very interesting and as part of my preparation I am endeavouring to read their work. I've already completed FERMAT'S LAST THEOREM by Simon Singh (a stunning book) and he is going to talk about narrative non-fiction. 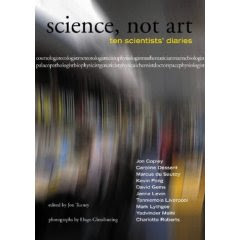 Today I am reading SCIENCE, NOT ART which is a book edited by Jon Turney, another of the speakers. 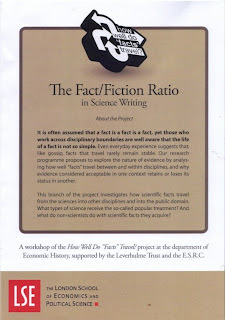 This is a collection of ten scientists' diaries and very interesting it is too - although some of their lives seem a lot more glamorous than mine ever was as a research scientist. Obviously times have changed. Each of these scientists seem to spend some time jetting around the world attending conferences, brainstorming and writing papers; although this is balanced with an impression of the mundanity of scientific life. Experiments don't work, grant applications are turned down and papers are rejected for instance; all of which throws the moments of success into bright relief. A couple of them also have children and one has a pregnant girlfriend and it is interesting to see how these aspects of their lives fit in with the demanding life of a research scientist. Experiments rarely fit neatly into the nine-to-five timeslot. I, in contrast, spent all my days as a research scientist in virtually the same spot, on a stool beside my bench around the corner from the poster of the page 3 girl stuck upon the wall. Sometimes, for a little variety, I would stand in front of a fume cupboard, and sometimes I would stand beside the sink attempting to rid my glassware of the burnt-on grime of my experiments. My lab coat was stiff and yellow with picric acid, and my safety glasses were reminiscent of the sort worn by geeks in fifties American films about the bomb. On very exciting days, when I had made enough of a particular compound to warrant running an NMR, I would make an excursion to the NMR room in the basement. Oh, that NMR room. I always felt like apologising for my existence as soon as I entered. Sometimes I used to stand outside the door summoning up courage to grab hold of the handle. The technicians there used to glower at anyone who opened the door and any requests for help met with surly replies. I expect it was the effect of living without ever seeing daylight. The book ends with a young doctor called Kevin Fong. Apart from being on call and grabbing very little sleep for nights at a time he is also involved in space science. His description of A&E and intensive care are moving in the extreme. After weeks with very little sleep in London he happily embroils himself in space research in Florida. He gives talks like I churn out words and I think he has far more reason to describe himself as tired than I do. Like several others in this book his story is inspiring. Last night I gave a talk to the Friends of the Chester Literature Festival. 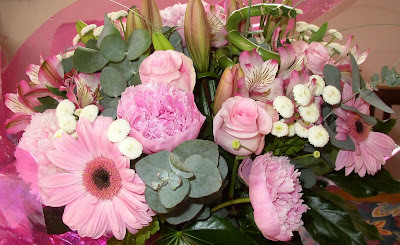 At the end of it they gave me these beautiful flowers. They are so gorgeous I thought I would preserve them here so I can appreciate them for a little longer. I was asked to talk about 'The Writer's Life' so I decided to plump for an autobiographical account of how aspects of my hapless relatives have tended to land in the middle of my fiction. Flicking through my work yesterday for examples to illustrate my theme I realised how much they are in there, especially my younger brother Huw: the time he ran into a lake aged three, for instance, or the way the fingertips of his left hand always held the imprint of his violin strings. I suppose, in some way, he is preserved there too. It is not him, of course, just a part of him. I suppose when anyone writes fiction there is a merging, a collision of experience, research and invention, which allows the writer to enhance an imagined event with a little detail which lends an air of authenticity. But for the large part I expect the writer has to rely mostly on the person he knows the best and the most intimately - himself. But this turns out to be not too confining; for instance with just a little exaggeration I found it worryingly easy to turn myself into someone else and imagine pulling the legs from flies, spearing slugs with sharpened sticks and even drowning an adversary with more strength than I have ever known, holding his head under the water until his limbs lay still. but the sound of nothing makes patterns on my skin. (A blog installation brought to you by Dr Grump). 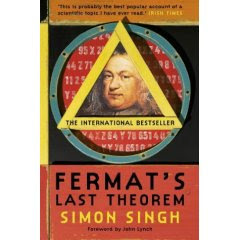 I have been reading Fermat's Last Theorem by Simon Singh today in preparation for a workshop I'm attending in the London School of Economics in April. I bought the book for my husband a few years ago and although he said he'd enjoyed it I have not got round to reading it myself until now. I'm finding it extremely interesting and surprisingly entertaining. Basically it is about a theorem, or more correctly a conjecture, which one Pierre de Fermat (a seventeenth century judge and amateur mathematician) claimed to have proved in the margin of a book (specifically a Latin translation of Arithmetica by Diophantus). Unfortunately, because Fermat loved to tease (and was also too impatient to painstakingly write out his proofs) the actual proof was never recorded or found. This is reminding me strongly of another genius I have just finished reading about in Genius in the Shadows by William Lanouette. 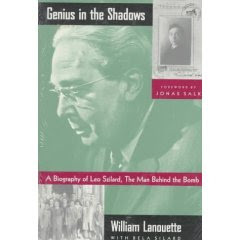 He was called Leo Szilard, a twentieth century physicist who thought of many original things during his strange but fascinating life. Like Fermat he was always anxious to move on. One of his friends described him as being like a bumble bee, going from one flower to the next. In Szilard's case the sort of pollen he left was advice. He lived most of his life from two suitcases, refusing to settle down, hovering from hotel to rented room, living just for his work. Well, the last few weeks I have done little except sit at this desk reading and making notes with occasional journeys to the gym. 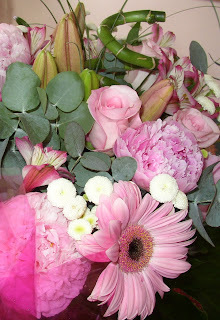 But today I reached a stage in my research where I could pause for a while so I am succumbing to the pull of the blog. There are still piles of unread books on my floor but lots of read ones too including my latest obsession which is THE HUMAN BRAIN COLOURING BOOK - which is exactly as described. Every day I colour in a page and in the process learn how the brain works. The most surprising thing I've learnt so far is that along the neurons there are bud-like things called 'dendritic spines' and these buds are 'plastic' in that they can grow, change shape and size and probably (one thing I like about this science is there is so much that is not known for certain) disappear altogether. The spines allow communication between neurons and so this is the way we make connections and think. The slightly dismal thing is that there seems to have been an unexpected frost in some parts of my brain and all these little spines (which once supported spines of their own) seem to have turned black and have dropped off through disuse. For instance Hodmandod Major asked me a very basic chemical question on the phone the other night and for a few minutes I couldn't remember the answer. Considering it was the sort of thing I used to know very well indeed it is a bit worrying...but then there are things I know now that I didn't used to know at all: how to make Jamie Oliver's Shin Stew, for instance. Which, now I think about it could well be of more use to me at the moment, all things considered. ...will be resumed shortly, I hope. I thought I would be emerging properly tonight, but no, something else has come up (just a bit more essential research). So this is just a brief sniff at the internet air to say thank you to Maxine at Petrona for the mention - and agree absolutely with her assessment of my fellow bloggers.